ODYSSEY: What do you get when you cross soldiers, superheroes, supervillains with a truckload of guns, in a children’s hospital in Iraq?! This month’s ODYSSEY, that’s what! CARPEDIEM: NINE IRON: Grab your woods and irons, and join the CarpeDIEm agents as they battle a haunted putt-putt golf arena – where deadly surprises wait in every hole! Carpediem Agents must save their leader, Sir 8th Day, from an army of clowns, commanded by the fascist Clown Nazi! But who is The Clown Nazi? And what is the reason for his grudge against Sir 8th Day? Find out in BY BLOOD A KING, IN HEART A CLOWN! Blazing Glory’s supernatural Odyssey continues, as John Wilson joins the war effort and ends up on the front line — in arm’s reach of ADOLPH HITLER! Weirding Willows gets ever weirder as the White Rabbit, Peter Rabbit and Benjamin Bunny lead Alice to the heart of the Wild Wood to face a destructive new visitor. Meanwhile, Dr Moreau and the Wicked Witch of the West finalize their deal for the creation of an army of Flying Monkeys. The anthology is in it’s second issue and continues to blow me away. Three different stories with three different tones in both plot and look. Each excellent in varying ways. Carpediem, continues to the story of the strange band of super-spies that is as bizarre in story as it looks. The characters and story is original, entertaining and fun, exactly what a comic should be. Odyssey is the least original of the bunch with a look and feel of a certain Marvel character. That’s not necessarily a bad thing as we’re only two parts in we’ll see how it differentiates itself. The art is beautiful and story is still entertaining. It just feels like I’ve “seen” it before. Mash-up tales, especially with literary characters, has been very popular these last few years and Weirding Willows is the latest example. Still, this spin is original and definitely entertaining. I’m still figuring out the world it inhabits, but we’re two parts in. And that’s the only negative thing I have to say about this series, I want more. The stories feel a bit short and as soon as I’m done I want to find out more. Any of these stories can be a series unto itself. They’re that good I want them to be, so I can get more of it at one time instead of bit by bit month by month. As I finish each issue I want to read more, that’s a good thing right? Take soldiers, mix in time travel and add a bit of dinosaurs and you get this series. It feel straight out of the B-Movies I used to watch on Sundays and that’s awesome. The first issue feels like the scene just before the credits roll in a movie, setting up the main characters and generally what’s going on. We don’t know how time travel works, but are given some rules in which this world runs. Given as a bit of dialogue that you know will come back later and be important, just like I’d imagine in a movie. The characters are cookie cutter and that’s ok. When it comes to soldiers do you really need more than the “nervous guy,” “wise guy,” and the “grizzled leader”? That’s what we get and I’m totally good with it, because this comic is all about pulp fun, not some deep introspection on characters or war. I went in to the comic fully expecting what it turned out to be. It knows what type of comic it is and wants to be and delivers it in beautiful pages and art. 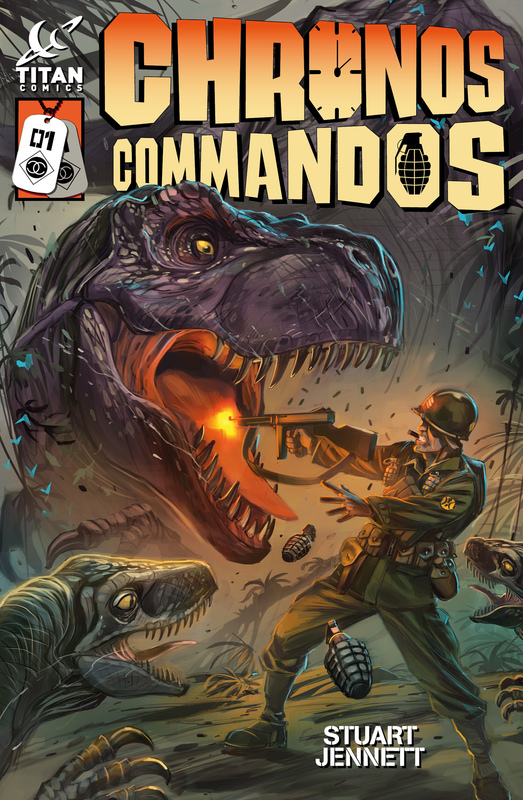 Chronos Commandos could wind up being one of the most fun pulp comics of the summer. I’m a huge fan of all things Princeless. 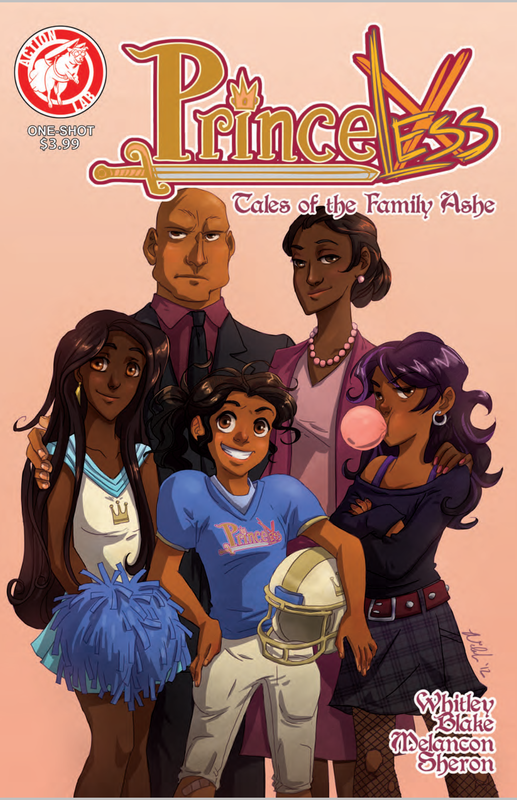 So, of course I’m going to recommend this one-shot Princeless: Tales of the Family Ashe by Action Lab . While Adrienne is having the adventure of her lifetime, her family is getting pulled into the fray! Learn what happens to the ethereal Angelica in the aftermath of Adrienne’s rescue attempt! Shudder to learn what horrible fate has befallen Adrienne’s next sister, Angoisse! And learn the rest of the tale of the young King Ashe, ensnared in the trap of the fiendish elves. 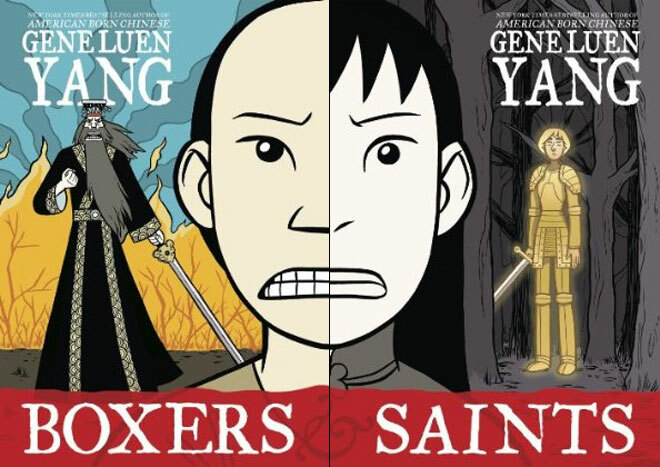 There’s numerous reasons to recommend this comic and series every chance I get. The first is, with this one-shot, we get more of what’s going on with Adrienne’s family. The second is, this is one of the few series that’s as smartly written for kids as it is for adults. Third, it’s also a series that throws out all of the stereotypes and tropes we see in other comics and stories, giving us a strong female minority lead. This continues to be one of the most important comics currently being produced. Here’s 9 other comics to check out this week in alphabetical order. 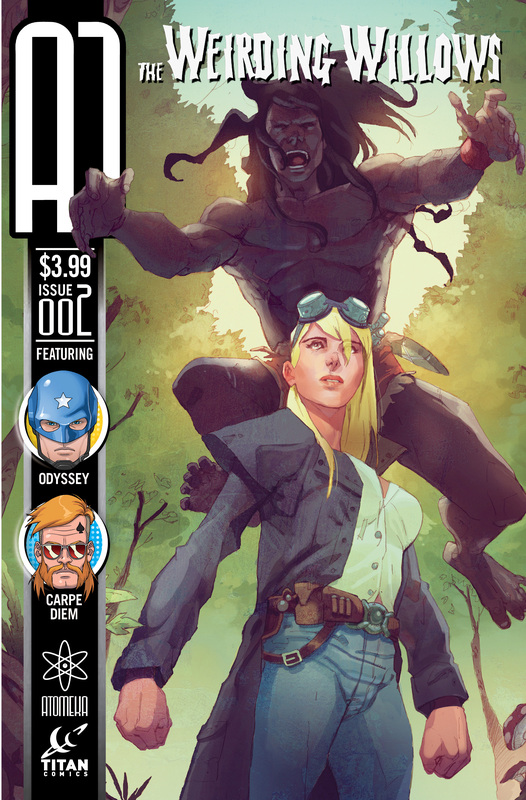 A1 #2 – The first issue of Titan Comics’ anthology series was beyond fantastic. I’m expecting more of the same from this one. Ghosted #1 – A horror/crime mashup that’s equal parts Ocean’s 11 and The Shining. Sign me up! Hawkeye #12 – One of the best Marvel comics on the market. It’s not afraid to shake things up in its storytelling techniques. Justice League #22 – Trinity War, nuff said. Night of the 80s Undead #1 – Another Action Lab comic. This time from their adult Danger Zone imprint. The series skewers the 80s with a mashup of zombies. Quantum and Woody #1 – The popular Valiant duo returns! Shelterd #1 – The men and women of Safe Haven have been preparing for any-and-all end of world scenarios for years. However, their bunkers, weapons and training can’t save them from the one threat they never could have expected: Their own children. The Standard #3 – This should be on everyone’s list. The publisher offered you your money back if you don’t enjoy it. The Westwood Witches #2 – A great horror comic from indie publisher Amigo Comics. In the second smashing issue of the award-winning anthology we find… CARPEDIEM Agents must save their leader, Sir 8th Day, from an army of clowns, commanded by the fascist Clown Nazi! But who is The Clown Nazi? And what is the reason for his grudge against Sir 8th Day? Find out in BY BLOOD A KING, IN HEART A CLOWN!